Welcome to TheFileGuy.com. 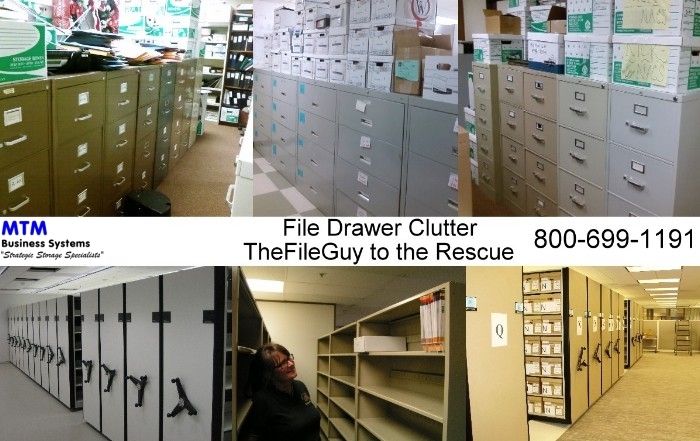 TheFileGuy.com is home to MTM Business Systems, a national company specializing in high density compact mobile shelving filing storage systems, automated storage and retrieval systems, shelving systems, multi-media storage systems, mail room equipment, weapons racks and other storage products for offices and warehouses. The Web site has an emphasis as becoming your resource for ideas and details for miscellaneous storage products. We also specialize in information management with custom file folders, digital imaging systems, computer generated color code strip labels, RFID file tracking and records management. We currently are giving special pricing on all High Density Mobile Shelving Systems, Law Firm File Storage Systems, Modular Casework Cabinetry, Tape Vault Mobile Storage Systems, RFID File Tracking Software, Mail Room Furniture Systems, Vertical Carousel Storage Systems and Combat Weapons Storage Systems. All you have to do is ask us for special pricing and we will respond as soon as possible.